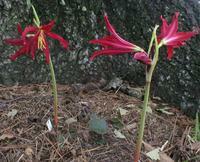 two flowers have opened on each of the oxblood lilies (rhodophiala bifida) (click the picture for a larger image). and each scape appears to have at least five six buds, rather than the four each i could see yesterday. i thought my five inch tall lilies were awfully small (height-wise, not bloom size), so last night i searched the web looking for info. as it turns out, r. bifida is considered a miniature, only growing to about 12 inches tall. a different photo of the lilies is now in the garden gallery.